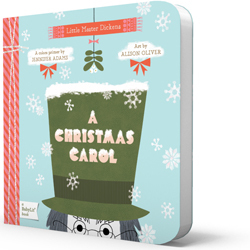 Take a walk with the Ghosts of Christmas Past, Present, and Yet to Come in Little Master Dickens’ A Christmas Carol: A BabyLit Colors Primer. See old Jacob Marley shaking silver chains, gold stars shining around the Ghost of Christmas Past, and a red scarf keeping Tiny Tim warm. This bright retelling of a Christmas classic will scare any “bah, humbug” feelings away.